New Season – Exciting Times Ahead – We Will Succeed !! As another new season now starts we look ahead to the exciting times for TeamABC. Last season was our most successful to date where we achieved so much in all areas of the club. Due to our massive successes the expectations of the club and its members have naturally increased this season to very high levels with everyone at the club now preparing themselves for the amazing challenge ahead of them. This season we start with a squad of 31 boxers (one of the largest in the whole of England) and our aim is to get them all out boxing at competitions and shows as often as possible. Last year we won 4 national titles and had good representation in these major competitions with some quality performances so we certainly aim to improve on that with the current team of talented boxers we now have. We now have boxers being selected by England Boxing to join their ranks and it’s hoped these continue to develop and indeed are joined by other club teammates throughout the season. Tommy Fletcher will be representing his country in the European Championships being held in Russia next month and we wish him all the best and hope this is the first of many occasions he boxes for England. We aim to get as many of our boxers as we can and as frequently as possible to club shows, regardless of time or location. The same can be said for sparring sessions as we won’t limit the experiences for our boxers. Last season we travelled the length and width of the country as well as overseas and this year we are prepared to rack up even more miles (another minibus is certainly required to enable us to make this more achievable so if anyone can help us with this it would be very much appreciated). Our development team is beginning to look healthy and we plan to get these involved at sparring sessions both in-house and importantly out on the road visiting other clubs too, its hoped some of these members will make the necessary progress before being elevated to the squad before the end of the season. Our number of recreational members is very good and a few are beginning to catch the eye of the coaches so it’s hoped some of these will be selected to advance into development sessions during the season also. We have a good crop of our future boxers within the Young Rockys where numbers are beginning to pick up nicely, and we are sure some of these are sure to move into the junior sessions once they reach the correct age. The Ladies boxing bootcamp we offer at the club for All levels, ages 17+ isn’t overly subscribed but hoped numbers increase during the season. We run 3 sessions a week with the workout being a mixture of punch bags, strength and cardio. Come and join in and see for yourselves Ladies!! It’s very pleasing as a club that we have equal numbers in junior and senior sessions and a good variance of recreational through to squad members in both too. We are also delighted to have a healthy number of female boxers in both, also ranging from recreational all the way to national champions and part of the England setup. Despite good numbers we still require and welcome new members to the club both young and old , male or female and any level of ability or fitness. None of our success is an accident or happened overnight; we have achieved such impressive results and built a club that is recognised as being one of the best nationally through lots of hard work and dedication shown by so many individuals. We have a fantastic coaching team developing our boxers and willing to take them all over the country to box and a wonderful team of staff looking after the club and carrying out the numerous tasks required to maintain its own high standards and running a club admired by many others. 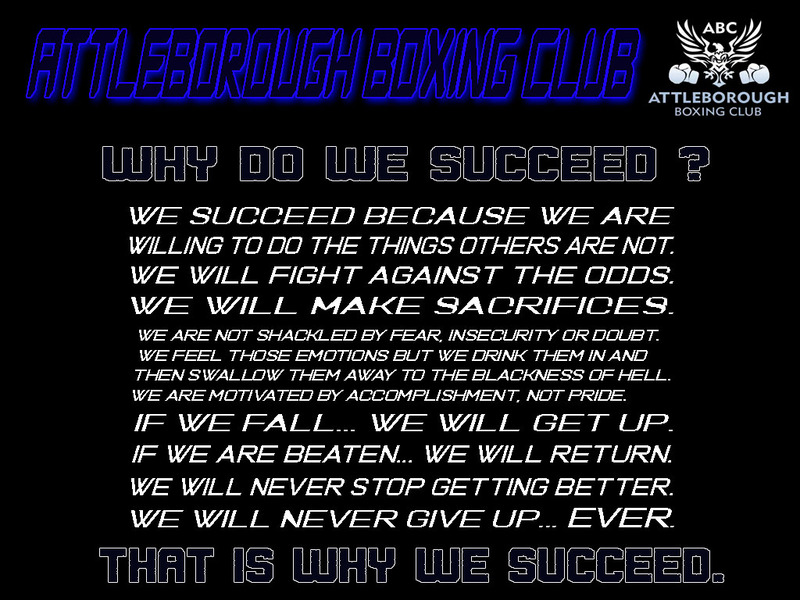 Many of these people putting in countless hours and demonstrating an unbelievable commitment towards the club and its boxers, let us also remember that each and every one of these are unpaid volunteers who do it for the love of the sport and in particular Attleborough Boxing Club. However there can never be enough help so if anyone is willing to help in anyway please contact the club. Obviously a lot of what we do or the levels we go to that make ABC one of the best clubs out there would simply be impossible if it wasn’t for the financial support of companies that so generously give to us and we sincerely thank you All. We have built great and long lasting relationships with many and long may this continue and we all share the success it brings. Unfortunately we currently have squad boxers that still need sponsoring so if you can help please contact the club. Of course the most important part of our club is the boxers themselves. Personal efforts are already being recognised throughout the whole club regardless of current goals, ability or group and if the work being put in is continued the rewards will follow. We now start to intensify the levels of training for squad members some of which will train up to 5 – 6 days a week, development boxers will increase up to 4 days a week in some cases. The high levels of commitment, dedication and self discipline required are unmatched in any other sport and we totally acknowledge and respect our boxers for the effort they put in and sacrifices they make to become the best they can possibly be and will support them every step of the way. The sparring has begun, shows are being mentioned, boxers have been entered into national competitions, training programs have been developed, A full week of sessions is now in place, boxing weights have been agreed, travelling around has begun, there’s a buzz within the gym. This can only mean one thing….. The season has started!!! Bring It On, TeamABC are ready for the exciting challenge ahead.